I rarely write reviews on products and services, because many that I've come across simply weren't worth the time and effort to do so. However, I'm very impressed by the quality and education that came with Mike's V-Power EA. The V-Power EA comes with 2 modes, a manual alert & entry function, and an Auto Entry function that only triggers once it meets a set of specific criteria. Personally, I find it best used in context of what the market is doing, so I use it within my market analysis and strategy. It's not something to be used blindly just because an alert comes up. 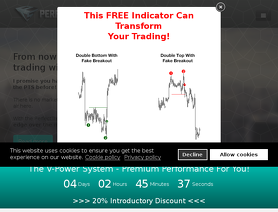 The rules for what to look out for are provided by Mike on the website and inside the Telegram Chat Group where other traders use V-Power as well. The EA works on the H1 time frame, but you can do your H4/D1/W1 analysis prior to activating the alert or Auto Entry function (which is what I do). 1) It's based on a permanent market edge, on the understanding of how market makers operate their business to make their profits. So I can be confident that the edge in this set-up won't be going away as long as the financial markets continue to operate. 2) The Auto Entry function saves me a lot of time and energy. I don't need to babysit the charts once I've identified a good opportunity to enter the market. I just activate the Auto Entry function, and go about my day. I check in once in a while, to see that the conditions are still valid and I still want my trade to be activated once the conditions are met. 1) It operates on a lot size entry, rather than a percentage risk sizing. It's not a deal breaker, because there are benefits to using a fixed lot size as well. 2) It works ONLY on the H1 time frame, but I can live with that because I don't trade lower than the H1. So it's not really for traders who scalp or trade the M1/M5/M15/M30 time frame. 3) You need to LEARN how to use it properly, as in read the educational material, test it out in demo accounts before using it on your Live account. While it's pretty straightforward, you still need to learn how to use it properly and what can/can't be done with the EA. 4) You can't really do much trade management with it in terms of scaling OUT. If you exit 1 partial (for e.g. out of 2 or 3 partial entries), the EA exits the entire position. The workaround is to remove the EA from the charts and manage the stops/profit targets manually. 5) Once you close the MT4 platform or change time frames, the alerts/auto entry function is deactivated. I'm not sure if this is a good or bad thing, because it makes sure I run through the charts and check that my alerts/auto entries are activated. It removes the possibility of me "forgetting" that I have an auto entry activated on a pair I no longer want to open a position in. As with any EA, the support that comes with it is critical. If there's any problems or questions with the functionality of the EA, Mike is there in the Telegram chats to answer and help out. So far, there have been minimal updates to the EA as it works well. Any issues are quickly solved and updates sent out to the group within a short turnaround time. Is it a 100% win rate strategy and EA? I wish, but obviously it's not. No EA does that over the long term, but with a solid understanding of the set-ups and bigger picture (that Mike has also shared with traders), V-Power is a very robust and positive expectancy strategy. I've had a nice string of winners before getting hit with a losing trade in most cases, which is dependent on how you adjust the SL/TP settings in the EA itself. i.e. if you want a bigger TP, then it's most likely your win rate will drop. And if you go for a smaller TP, your win rate will be higher (all things being equal). For me, it's the edge that comes with understanding how market makers operate and taking advantage to be on the same side as the smart money that makes V-Power an excellent tool and trading strategy. Mike is an experienced trader and has lot of knowledge All the trading systems and strategies he created by him are of high quality and help trade better . V Power EA and system created by him is incredibly great. He provides great support for all his systems and stands by his products . I own nearly all of Mike's products. This is about the best experiences I have had with any Vendor. Mike provide great products, service and support. I am a very satisfy customer and will support any products he put out. Not to mention he has amazing write up about trading in general. A++ Keep it up! You just set the alerter to your requirements, walk away from the charts, and wait for the high probability alert which in 80% of cases will be spot on where there will be impulse and momentum created by the smart money. Without Mike's system, it would be like trying to find a needle in a haystack. If you never or rarely ride a trend giving you 5r or more, you need to take a look. Great service and a very reasonable price. This will give you a huge edge in the market.. Nothing worked consistently in forex until I used the Edge EA. Since I've been using it I've only had 1 loss and a good string now of winners. Combine trend analysis and this EA and you make pips. Excellent EA, finally found one which works. Absolutely amazing products, Mike is a trustworthy seller and his knowledge and guidance can help any trader from beginners to advancers. Double top/bottom indicator is my favorite and the 8 timeframes scanner is a great tool. Great support too, five stars.